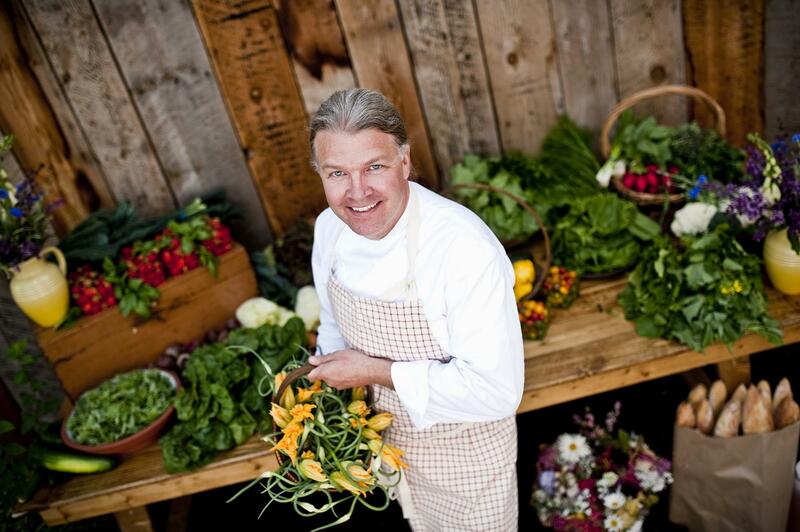 Surrounded with the season's bounty, Executive Chef Drage holds a basket of garlic scapes and zucchini flowers. In April, on a sunny day at winter’s end, my husband transported us from Billings over rivers, through pine forests and alongside mountains. In five hours we arrived at The Ranch at Rock Creek. No signs led to this place. Written directions were provided after we secured our reservations, but for my own assurance, I activated my phone’s GPS. The mechanical voice from my phone kept us focused on our journey especially as views mesmerized us the entire journey. Blue skies above and green carpets of grass and trees below enveloped us. As we drove through the tall log gate and up Carriage House Lane, I was reminded of hotels in our national parks. I sensed the influences of the Old Faithful Lodge in Yellowstone, El Tovar in the Grand Canyon and Yosemite’s Ahwahnee, now renamed the Majestic Yosemite Hotel presented at a more intimate scale. My husband and I are here at the Ranch after we were the highest bidders for this auction item at the Montana Restaurant Association Education Foundation ProStart Fund Raising Dinner. The Ranch at Rock Creek is a special occasion destination for most and currently cater to clients mostly from both coasts of the United States. We had never heard of the Ranch at Rock Creek until a few months ago. As we stepped out of the car, I wondered why it took us so long to finally get here. 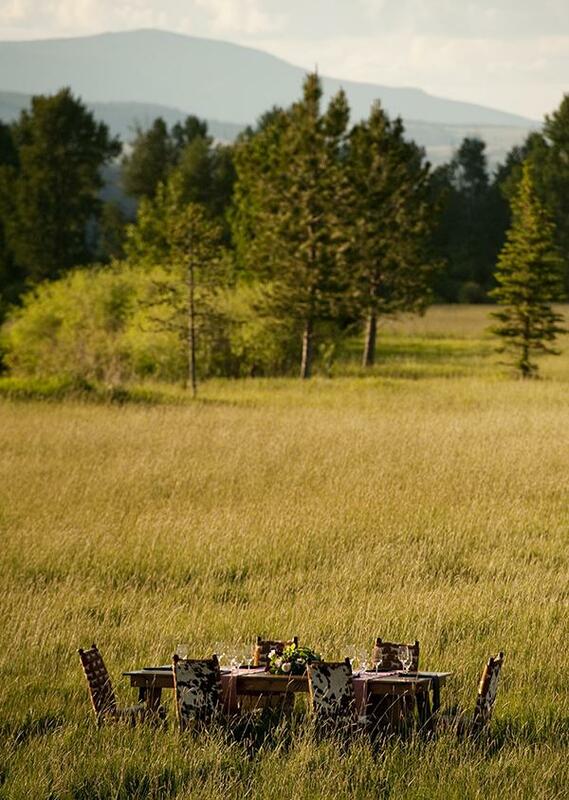 Al fresco summer dining at The Ranch at Rock Creek. Jim Manley opened The Ranch at Rock Creek to the public in 2010. 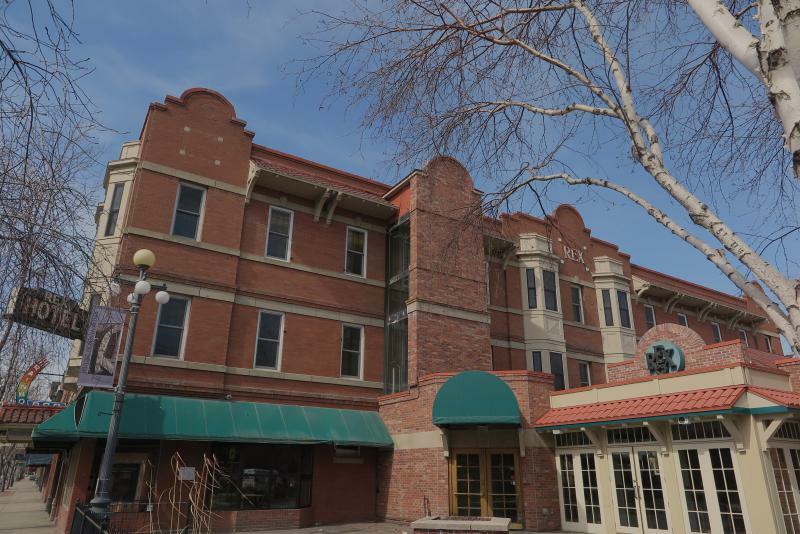 The property was homesteaded in the 1800s and passed on to several owners. Manley was looking for a place that off the beaten path and yet close to access points from far away such as airports and highways. Also, the property had to have access to recreation year-round from fly fishing to horseback riding to skiing in the winter. In eight years since its opening to the public, the resort has earned membership in National Geographic Unique Lodges of the World and Relais and Chateaux’s collection of gourmet restaurants, boutique hotels, resorts and villas. The Ranch is the only guest ranch to receive a Five-Star rating from Forbes Travel Guide. As we settled into our room named Springfield, one of the nine rooms in the Granite Lodge we breathed an exhale. The wood paneled room with canvas colored ruffled bottom curtains suggested ranch cabin or tent in the woods. The king bed with a ribbed beige colored bedspread draped with a folded red velvet comforter invited cozy rest. Hairy faux fur pillows and round leather chairs trimmed with natural nailheads and fringe hinted at Western wilderness. But amongst the allusions to the ruggedness of Montana, a small refrigerator was stocked with drinks and snacks while a bottle of wine awaited opening. WiFi kept us connected to the world beyond and a flat screen TV captured news and programs from beyond. On the dresser, we found a welcome letter and then an itinerary with “Welcome to Montana" emblazoned across the top. Aside from food, drinks and accommodations, the tariff included two guided activities each day. From choices of horseback riding, target sports, rope course and trail adventures including hiking and biking, we opted to fly fish. 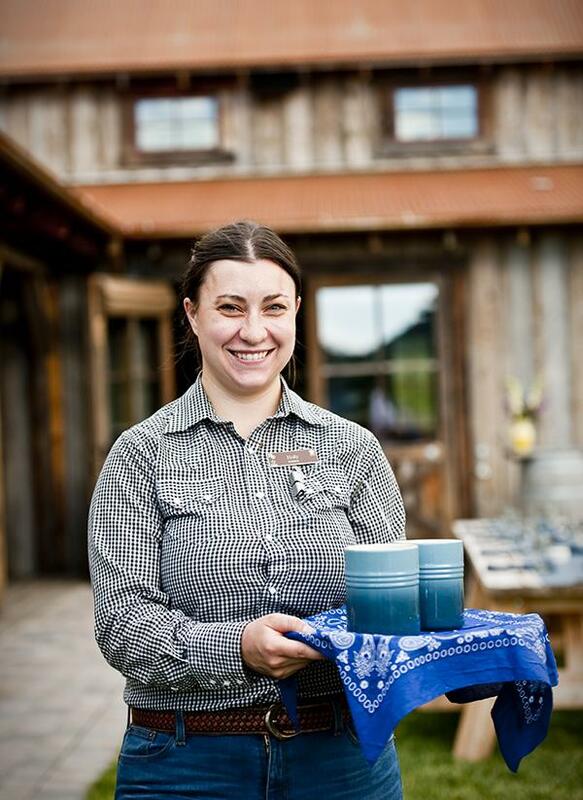 Holly Grob, Service Manager serves up drinks, Montana style. From the main lodge, we grabbed the two mountain bikes labeled with a license plate with our room’s name. We dropped downhill, across the main road and over the bridge atop Rock Creek. We moved towards the Welcome Pond and Buckle Barn to the Rod and Gun Club. Here one could buy or borrow anything needed for an outdoor or indoor Western adventure. Hiking boots, cowboy boots, wrangling hats, and backpacks were available. After donning waders and wading boots, we were ready to go. Keith McGlothlin assembled rods for us. He escorted us down Rock Creek to hook several rainbow trout even with the rush of the spring runoff. McGlothlin is from Laurel, the town just east of Billings. From the hours of whipping up the waters, I was ready for a drink. I moseyed up to the wood bar crowned by a massive steer long horn in the Great Room with chink log panels anchored with a stone fireplace and moose antler chandelier. Leather and hide couches were arranged into several conversation groups while tables offered places for friendly game playing. Bartender Brooke Lenininger made me a “Prairie Violet.” The gin-based drink came about “with a guest who had asked for a gin gimlet but she wanted some mint in it,” Lenininger shared. The final version held a lavender hue from blueberries, and herbal and floral essences from Crème de Violette and mint finished with the freshness of lemon. Featured drinks on the Seasonal Libations menu included “The Bandito” made with tequila and “The Moonshine Sidecar” made with a house-made orange curacao. A colorful palette of the season's summer bounty with freshly harvested red leaf lettuce and grilled beets and feathers of aged cheese. “We hire the right people where that guest service is innate or natural for them (the employees), that consideration of other people. We try to look for people who have a background in hospitality or customer service,” Johnson said of creating the best hospitality team. Jon Martin, General Manager who just joined the team of the ranch explained why he came to Big Sky country, “I love Montana, number one. I could not think of a better place I want to be.” “What I find is true is Montanans are the greatest and most hospitable people, most genuine people in the country. The nice thing is that is true of those that grew up here in Montana and those who move here. No one ends up in Montana by accident,” Martin added. Martin further shared of The Ranch experience, “Let’s keep this genuine. Let’s make sure we are doing it right no matter what it was, whether it’s the bikes or horses. We are picking the vehicles we pick people up from the airport. The way people look when they pick you up is important. Every single bit is important. The way the roads look and feel when you walk back to your accommodations and all those things are important to the experience you have here, and nothing has been overlooked.” The people they hire and the experiences guests participate in must be authentic. 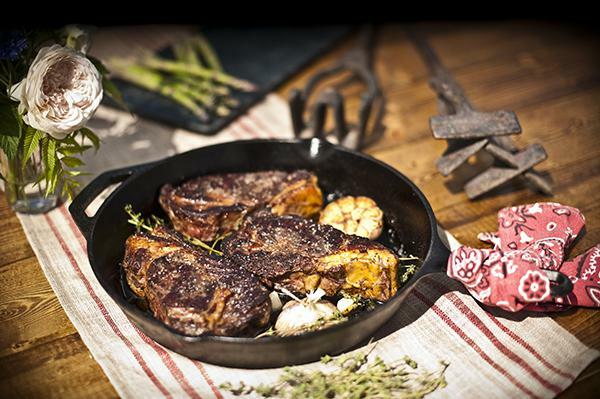 The iconic grilled steak served in a cast iron skillet for outdoor summer feasting. The Forbes Travel Guide is the only independent, global rating system for luxury hotels, restaurants and spars. In 1958, the company started as Mobil Travel Guide, the first Five-Star rating system in the United States. Properties around the world are reviewed with anonymous inspectors evaluating up to 900 standards. The company offers consultation services and training that The Ranch at Rock Creek have utilized. With our spirits warmed with Montana cocktails, our appetites were ready for dinner. We walked into the dining room past a crackling fire in the stone fireplace to be escorted to a table for two by the panel of windows as shadows played in the hills across the way as the sun lowered into the horizon. The décor of the room incorporated samplings of a hunting shelter to a homesteaded house to a log cabin in the woods. Native American textiles cover the wood stick chairs while black and white check curtains panel the windows. The first course of semi-soft, washed rind cheese’s smooth creamy texture contrasted the crunch of the Marcona almonds and sweet and sour of the blackberries. The second course played freshness from spring greens grounded by the rich, sour and herbaceous buttermilk dressing with tang and creaminess of the blue cheese. Saltiness and crunch of the pecans, the surprise of a peeled marinated grape with the final burst of the pickled onions made for a flavorful and texturally balanced salad. I opted for the Alaska Rockfish with an airy crust encasing a generous serving of moist flaky fish. A carrot slaw added freshness and all four tastes point with the addition of umami, the fifth taste of savoriness from the inclusion of fish sauce. 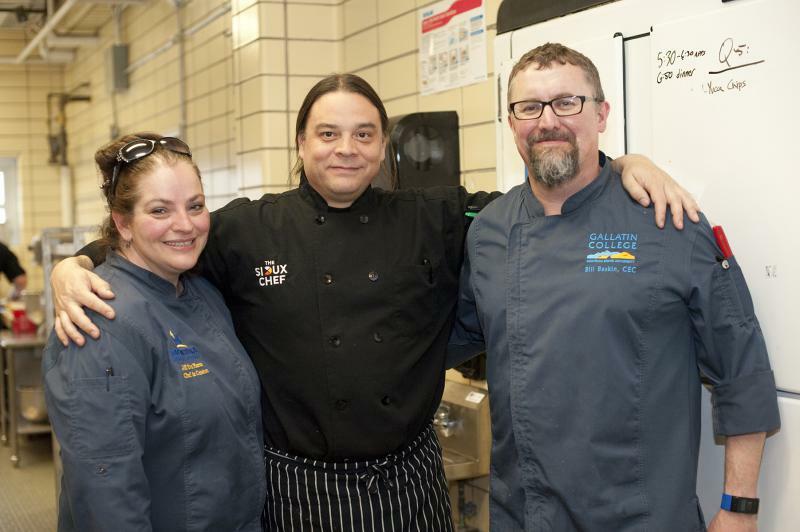 Drage’s task is to satisfy up to 125 guests at a time along with catering special events. He joked about guests, “They are not going across the street if they have a bad experience here.” Over a course of a week, Chef Drage offers a variety of dining experiences with a Chef’s Tasting Menu on Monday and Friday nights with other options of a Rodeo Barbecue, Chef’s Grill and Dutch Oven Dinner on other nights. When the weather is good, meals move out of the Granite Lodge dining room to the Flagstone or the Buckle Barn. Lunch can rotate to the Blue Canteen located at Camp Roosevelt. 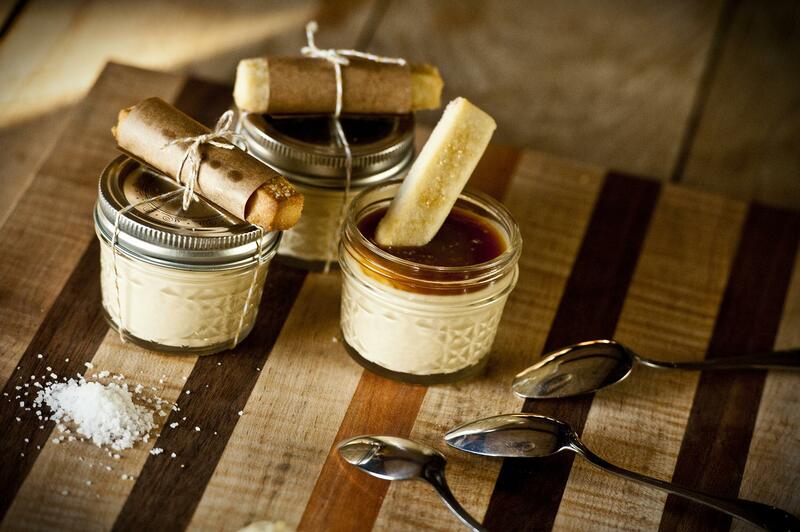 Delicious richness from Salted Caramel Budinos to end a dinner at The Ranch. 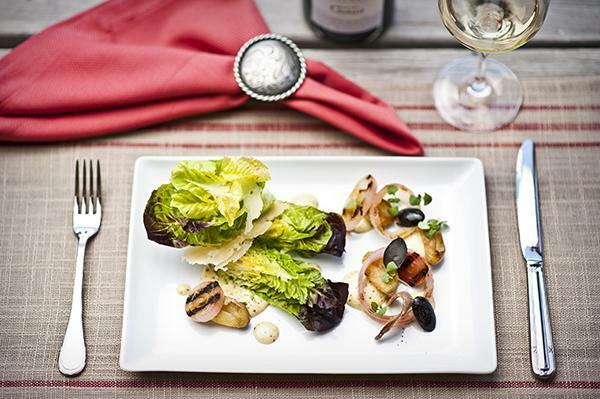 To continue to bring authenticity to the food served at The Ranch, Drage sources locally as best as he can. He values the contributions of those who produce the food he cooks. To show appreciation and for want of building good relationships, The Ranch invites neighbors and producers as guests every year for a meal or a night’s stay. After devouring the last bites of apple crisp and ice cream, we walked over the Silver Dollar Saloon where we bowled in the four-lane alley, attempted a game of pool, and shot some darts. My right arm ached from the activities of this day as we headed out. We crossed the courtyard and stopped at the firepit encasing smothering logs to warm our hands. We thought of settling in the chairs set around the fire but decided we would call it a night. The next morning after eating several a mini plain croissant, a small cinnamon roll and a chocolate filled croissant in the Great Room, we moved into the dining room as we brushed off the light flaky crumbs from our indulgence. Breakfast for me this morning was Avocado Toast served on a long plate with a long slice of toasted artisan break topped with mashed avocado garnished with micro greens, peeled red and green cherry tomatoes and slices of radish. An orange slice prettied a corner of the plate. On the Tea and Coffee menu cowboy speak has been incorporated. “JAMOKA” the noun for strong coffee and “STEAM ENGINE” the word for tea pot title the categories for the morning beverages. I order an almond latte that was filled without hesitation. As we were finishing up breakfast, we heard the table next to us request smoked salmon which was not on the menu. The waitress quickly and graciously said she would check with the chef if the request could be accommodated. At The Ranch at Rock Creek, the word ‘yes’ means someone would try to fulfil your request. ‘Yes’ means you would receive what you anticipated without ever having to ask. ‘Yes’ means good memories were created and you want to return. On this January morning in Billings, darkness hung heavy in the snowy coldness. But on 17th Street West in Billings, light emerged through the windows of Caramel Cookie Waffles. 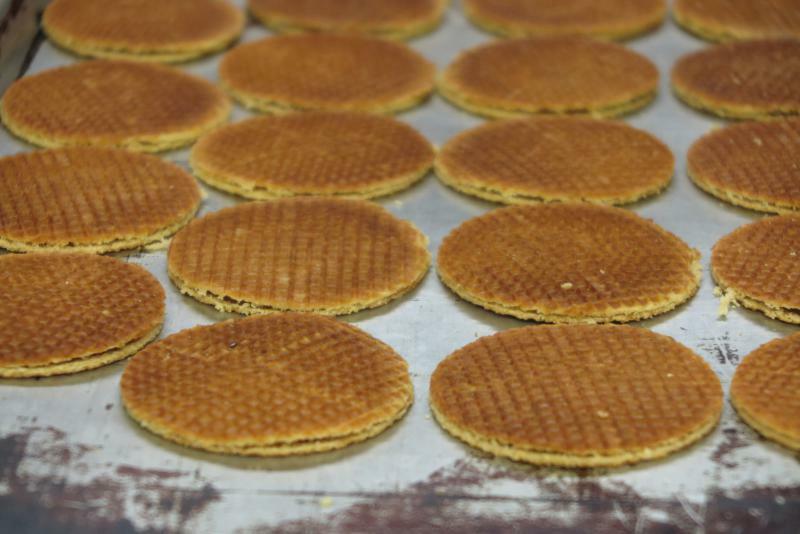 At 5:00 a.m., Jan Boogman began the day making the caramel cookie stroopwafels he and his wife, Judy have been selling for the last 30 years.